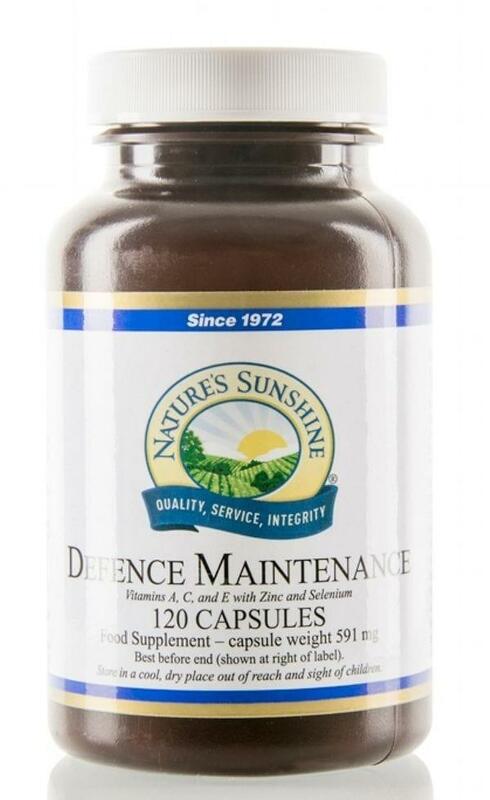 Defence Maintenance (Immune) is an essential product that enriches with nutrients that help to control and support your healthy immune system. The product has in its formula a lot of antioxidants, beneficial cruciferous vegetable powders, vitamins and minerals that maintain immune functions. One capsule has vitamin A (500µg), vitamin C 120mg, vitamin E 60 IU (44mg), zinc (gluconate, oxide) 5mg, selenium 25µg in its formula. These elements are in a base of, eleuthero root, selenium, asparagus stems, acai berry concentrate, broccoli flowers, cabbage leaves, ganoderma fungus, schizandra fruit, turmeric root, zinc oxide, silicon dioxide, and magnesium stearate, (herbages dried and powdered). 120 capsules in a bottle. Do not use in case of pregnancy or possible pregnancy without doctor's advice.